With increasing settlement north of Sturgeon Bay in the mid 1860’s, there was a corresponding growth in the volume of maritime traffic passing through the channel between the Strawberry Islands and the mainland in the area of Fish Creek. To light this passage, the Lighthouse Board requested an appropriation for the establishment of a Light on Eagle bluff in its annual report for 1865. Congress responded with an appropriation of $12,000 for the station’s construction in 1866, and with plans for the station drawn up the following winter, construction was expected to commence with the opening of the 1867 navigation season. However, with lighthouse construction on the lakes reaching a feverish pitch, work crews were taxed to complete all of the projects for which appropriations had been made, and the work crew scheduled for the Eagle Bluff project was redirected to Escanaba to begin construction of the Sand Point Light. Thus, construction at Eagle Bluff was postponed until the Spring of 1868, when a work crew finally landed with the necessary supplies to commence construction. After blasting-out the basement from the solid rock, a 9' 4" square tower and attached 26' x 30' two-story keepers dwelling were erected of cream city brick atop the bluff. While following the same overall plan as employed in the Chambers Island light, the tower shape was modified to be square in plan, so as to provide a noticeably different day mark. The circular cast iron stairway spiraling within the tower served as both stairs between the two floors of the dwelling and as access to the lantern above. The ten-sided cast iron lantern room, fabricated at the Lighthouse Deport in Detroit and shipped to the site in sections, was reassembled on top of the tower. Henry Stanley was appointed as the station’s first Keeper. After arriving at the station on September 14, Stanley assisted the construction crew in putting the finishing touches to the station over the following month. Finally, the District Lampist arrived to assemble the fixed white Third and a Half Order Fresnel lens within the new lantern room. 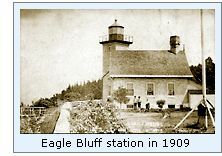 With work on the station thus complete, Stanley climbed the tower stairs to exhibit the new Eagle Bluff Light for the first time on the night of October 15, 1868. With a tower height of forty-four feet, and the station’s dominant location high atop the bluff, the 860-candlepower lamp within the lens sat at a seventy-six foot focal plane, and boasted a range of visibility of 15 miles in clear weather. Life at Eagle Bluff was likely relatively uneventful over the following twenty-five years, as little mention of the station appears in district records beyond records of minor repairs being undertaken. 1893 saw the erection of a 16-foot by 24-foot barn for Keeper Stanley’s horse, and five years later a detached summer kitchen built to the rear of the dwelling. After delivery of materials too late for construction in the 1899 season, a work crew returned in 1900 to erect a red brick oil storage building with iron roof and door to the east of the dwelling. 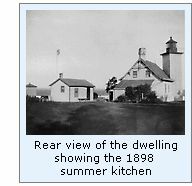 After fifteen years at the station, Keeper Stanley accepted a transfer to Sherwood Point in 1883, with William H Duclon transferred from the Beaver Head light station to replace him on September 20. During their thirty-five years at Eagle Bluff, William and Julia Duclon would raise a family of seven boys at the station before William retired from lighthouse service in 1918. Duclon’s replacement, Peter Coughlin arrived at the station just in time to oversee the replacement of the original Third and a Half Order lens with a smaller Fifth Order lens, which he tended until the lens was automated through the installation of an acetylene light with sun valve in 1926. The property sat vacant until 1936 when the Lighthouse Service leased the dwelling to the State Park. In 1960, the Door County Historical Society received permission to restore and operate the facility as a museum, and a two and a half year restoration project began, culminating with the reopening of the building to the public in 1963, the purpose the building serves to this day. 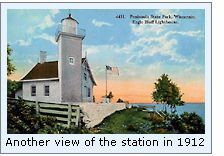 Click Here to see a complete listing of all Eagle Bluff Light keepers compiled by Phyllis L. Tag of Great Lakes Lighthouse Research. Take Hwy 42 into Fish Creek. Turn west into Peninsula State Park. Proceed to the Park office and purchase a pass and obtain a map of the park from the office, and follow the directions on the map to the lighthouse. Guided tours of the building are offered every half hour. Personal observation at Eagle Bluff, 09/11/2000.